Im trying to test the ball kicker coil going to the shooter lane. I need to put the the neutral wire on the transformer to the non power side of the coil. The transformer isnt clearly labeled can someone id the neutral 28v lug? Can someone also tell me what switch on the Score motor fires the ball trough coil? I'm missing the schematic. The ball trough coil is very weak when it's fired and it cannot send the ball all the way to the shooter lane. 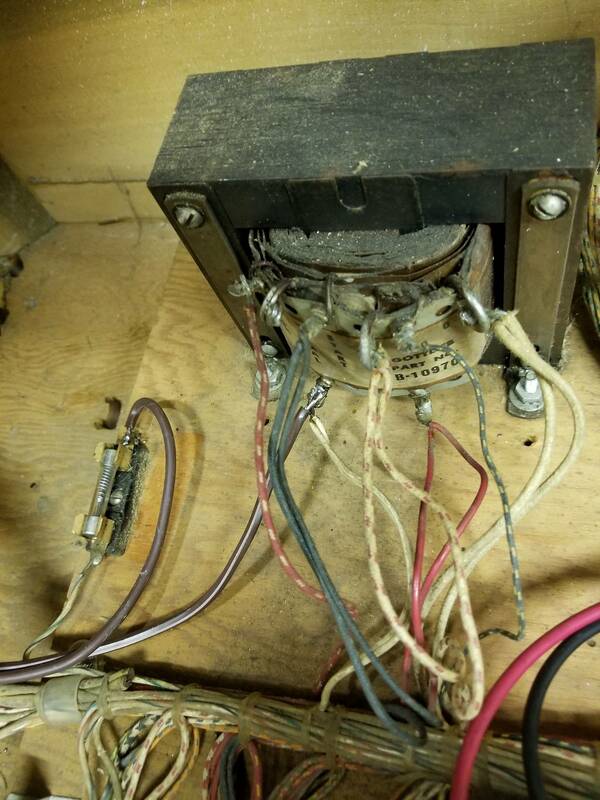 The solenoid 25V supply doesn't strictly have a neutral side since neither transformer lug is grounded, but the red wire from the transformer goes through a fuse before connecting to the various switches that control the solenoids and relays. The black wire usually ties directly to the solenoids and relays. If your wire colors don't match this schematic you should be able to trace back to the transformer from the ball return solenoid through the O relay switch, score motor switch and the fuse. The brown zip cord in your photo looks like a replaced power cord which would make the fuse shown the line (120V) fuse. I'd guess that the black wire is on one of the 25V lugs (as shown on the schematic) which goes to most of the relays and solenoids. The red-white wire to its left is probably on the other 25V lug. A quick check with a meter would tell you for sure. Be extra careful since there is exposed 120V in the area. The red-white wire probably goes to the 25V fuse before going to the switches that control the game relays and solenoids. Yep, this looks like its set up for 5v lighting as well as the 6v. Top right is return for both 5v and 6v, black white 5v, white with red tracer 6v feed. And for shame your game is set to high tap! Move the top left red white over 1 lug to the right (labeled as start). As mentioned in another thread line voltage is now 123v, literally on high tap anyway. The ball will always trigger the coil and it kicks the ball but it's not enough and the ball returns to the out hole. The coil # a1468. Is this the correct coil? Your picture shows A-1496, which is the correct Ball Return coil for Gottlieb Sure-Shot, so almost certainly, yes. The schematic lists the coil part numbers if you want an even more definitive answer. The ball will always trigger the coil and it kicks the ball but it's not enough and the ball returns to the out hole. It could be a mechanical problem instead of an electrical problem. Is there wear, slop or friction in the motion of the kicker between the solenoid plunger and the kicker itself? If you hold he plunger fixed in place, can you move the kicker at all due to a loose linkage or an elongated hole? Are you getting the full range of motion of the kicker or does it bind up somewhere so you only get half a kick? Is the coil sleeve dirty? Is the plunger mushroomed at the end, or does it have a burr that's dragging inside the coil sleeve? Is the return spring too strong? It could be a mechanical problem or an electrical problem. Here are a couple ways to find out which. 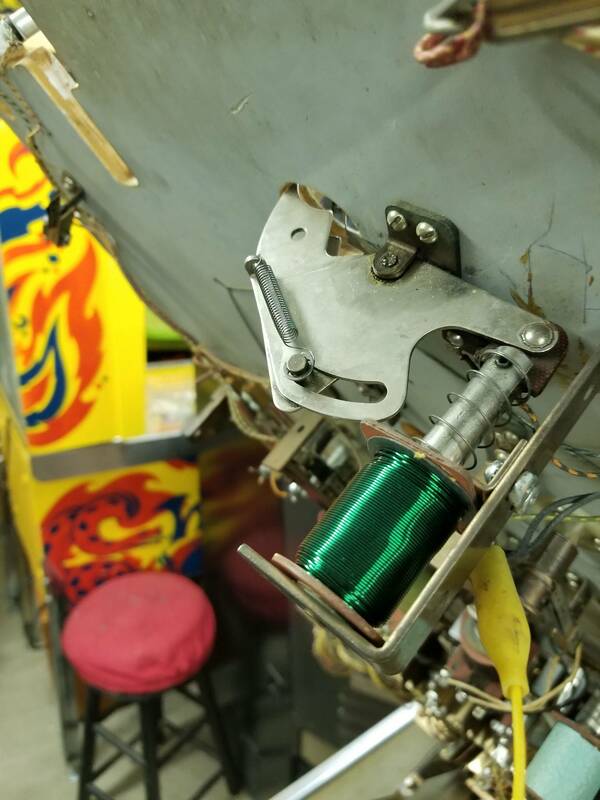 - With the machine unplugged you should be able to reach in the coin door and sharply activate the ball return solenoid. If that moves the ball to the shooter lane, you probably have an electrical problem. If not you probably have a mechanical problem. - You can activate the ball return solenoid with Alligator clip jumper wires. If that moves the ball to the shooter lane, you probably have an electrical problem. If not you probably have a mechanical problem. 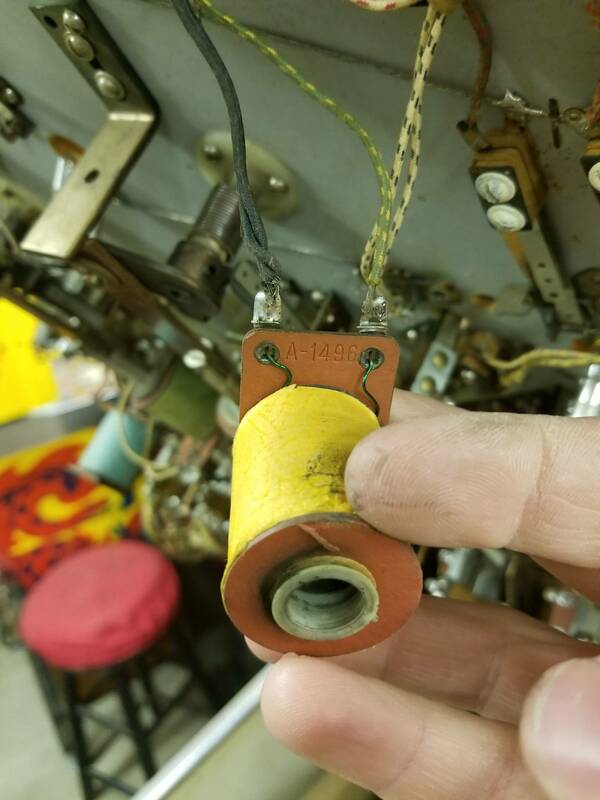 It's almost always a mechanical issue with the kicker arm, the ball hitting the underside of the apron, or the score motor switch that is in the outhole kicker circuit. All you need to do to test the coil is check the resistance. No need to try and make the coil fire in any way. And there is no "power" side to the coil in any case. It will work with either wire on either solder lug. If you've got resistance in the 2-5 ohm level, you're good. I was having a similar issue on a Big Indian, ball not always making it to the shooter lane... I bent the bracket that holds the coil to give the solinod rod a little more travel, worked great. No more issue.